www.VIGILANCEVOICE.com "Help Me Find My Daddy"
GROUND ZERO, Manhattan, Sept. 16—I scanned the pictures on the “Wall Of Hope.” The missing were displayed as smiling, happy people, their pictures reflecting their most joyous moments of life--wedding pictures, parties. They were dressed up, smiling, full of life. Many were with family, friends, loved ones, children. One picture captured my attention. I riveted my eyes upon it. It was of a little girl, about two years old, standing next to a red and yellow plastic scoot-along taxi. The play car was similar to the one I strapped on the back of my daughter’s C-J 7 Jeep I towed to New York a year and a half ago from Orange County, California. My wife and I moved to New York City to be near our two daughters and grandchildren Adam, 5, and Sophia, 3. The red car I hauled nearly three-thousand miles was a spitting image of the one on the Wall of Hope, except that ours was faded by time and weather, and the wheels were slightly bent outward, and there were a few nicks and scratches on it, and the push-horn had lost it Voice. But it provided the same fun. It was only time that differentiated it. I looked into the little girl’s eyes who stood against the bright red and yellow push car. She stared out innocently, holding onto the car for balance. Sitting on the grass beside her was her father. He was smiling, radiating the joy fathers enjoy with their children. I knew that feeling. I knew that joy. Above the picture blazed a heart-wrenching hand-written headline: “Help Me Find My Daddy!” The missing father’s name is Josh Jacob’s. A phone number completed the plea. I stood for a long time and tried to see inside the eyes of the child. I studied her innocence. I had seen those eyes before-the innocent eyes of children of war, victims of its tragic, brutal hand. I forgot how their faces haunt me. Thirty-five years ago in Vietnam, I participated in the horror and destruction that changed the lives of countless Vietnamese children. We bombed and napalmed and strafed and burned countless villages. I wondered if there was much difference between the children of 2001 and the Vietnamese children of 1965 and 1966 when I participated in the holocaust of the Vietnam War. I didn’t want to think about it, because I am not anti-war. I am only anti-Terrorism. But I couldn’t separate the two distinctions. As I looked into the child’s eyes, I realized my own grandchildren were no longer safe. I hadn’t thought of that before. It was only Ground Zero Plus Five Days. I was still reeling from the impact. My grandchildren would grow up as the Vietnamese children, remembering the terror of war. Josh Jacob’s child would grow up knowing another kind of Terror--the Terror war brings upon the innocent when it takes away the closest loved one. Three and a half decades ago I saw the future of children in Southeast Asia savagely changed by war. I witnessed their innocence die as I knew the innocence of Josh Jacob’s’ daughter had died--even if she didn’t know it yet. She would. As she grows up, her mother will be forced to explain the death of her father. She will be faced with telling her child that her father either died a senseless death at the hands of evil men, or, that her father died as a hero to protect her and her children and their children from future harm. It will be a tough choice--to decide how to plant the seeds of her child’s father’s death in her innocent mind. I wouldn’t want to be in her shoes. But I knew what those shoes were like. I had seen mothers like her crying and wailing over their dead children thirty-five years before in a land fifteen-thousand miles away. I remembered early in my combat experience walking through a village we had just shelled with artillery. Five-inch shells do not discriminate between the enemy and the innocent--neither do smart bombs. This particular mother was scurrying about, collecting pieces of her dead child that had been blown away so she could bury her offspring as a whole--so it could go to Buddha Heaven as one, and not be lost in purgatory because its body had been dismembered. I quietly cried in those horrific moments of shame when struck with the fact that war destroys the children--sometimes physically, always emotionally. Our medics healed as many of the wounded as possible. We did our best to match up the children with a relative. Then we had to move on to the next village where the next level of carnage awaited....where another tear would be shed for a child cleaved from its mother’s breast or father’s strong arms. I have a special attraction to the lost children of war. In a feeble way, I understood their loss of innocence, their pain of separation from the people they loved the most. My own father had gone to war right after I was born. And he didn’t come back. It wasn’t because he was dead. He just didn’t come back. He chose to abandon my sister and me. He divorced my mother. And he never came to visit. I was nine months old when it happened. But I remember seeing a picture of myself and my sister with him in uniform just before he left to never return. I used to cry for him. Cry that he was gone from my life. I never could understand it. Children never can. They only grow to accept the feeling of emptiness--an emptiness that can never be filled again. I knew that Josh Jacob’s child would know that emptiness. I knew thousands of Vietnamese children knew that void. The words shot into my eyes and spun in my head. As a little boy in Hood River, Oregon, I waited every day for my father to come home even though my mother told me he wasn’t ever coming home again. I secretly waited on the porch to see him turn the corner. On my birthdays I ran to the mailbox in hopes he would send a card. At Christmas I yearned to see a special present under the tree from him. Nothing ever came. But I didn’t stop hoping, believing it would. He was the living dead. For those children who will never know for sure their mother or father or close loved one is dead, they will wait too, as I did, hoping. It is the nature of a child to have impregnable Faith. A child’s belief is born of fairy tales. In fairy tales the cow can jump over the moon, and the cat can run away with the spoon. Fairy tales help teach children the impossible is possible. I believed it. I believed upon every waking moment my father would appear someday--out of the mist, arms open, telling me he loved me, he missed me. But every day my heart was broken when my father didn’t come. The fairy tales helped me keep the dream alive he would. And I treasure that “fairy tale” power of belief today. I treasure it because it makes me aware the pain the children of September 11 suffer will be softened by their secret belief that one day, out of the mist their loved one might appear. Such belief gives them time to accept the truth. As time passes, their hearts will harden with reality, and they can try to accept the truth of death as we know it. That will be a sad day when innocence converts to reality. But it need not happen. The children can make their parents and loved ones live again, forever, not in just a fairy tale, but in a reality of truth. They can see their loved ones as Spartans of Vigilance. They can see them standing tall and proud over the World Trade Center, like the Statue of Liberty, ever vigilant, watchful, caring, protecting. They don’t have to wait until monuments are built to honor the dead of that day. The living can immortalize the death of the loved ones today, tonight. Instead of forcing a child to keep the secret wish of their loved one’s life hidden in their heart, the child can stand at the window or look down the street toward where the WTC once proudly stood, and see the Spartans of Vigilance standing guard, even prouder and taller. Sharing with a child the fairy tale of life in death, softens the border between innocence and reality. It salves the child’s soul so scar tissue doesn’t form, and hatred and revenge and anger and resentment fill the emptiness left by the Terrorists. If those feelings fill the child’s heart, the Terrorists have won the true purpose of their battle. They have instilled fear into the veins of future generations, and turned innocence into hatred. If that happens, the Terrorists will have stolen our children from us. They will have raped their innocence. We cannot allow that. 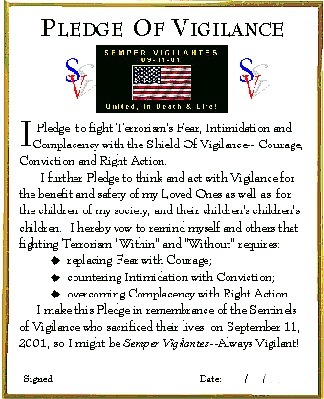 We have the option to select “Semper Vigilantes” rather than Hate and Anger as our battle cry against Terrorism. And our children...they can see things we cannot. They can see the Spartans far clearer and with greater truth than we--the adults who feel the bitterness, the anger, the need to let blood to revenge the senseless killing. We want our pound of flesh. We want to convict and prosecute the responsible, and then feel closure. But the child does not understand that. The hanging of the Terrorists, or the blowing them away, will not in any way fill the emptiness in the soul of Josh Jacob’s child, or in my grandchildren. Killing and revenge are the domain of adults. Don’t misunderstand. I could hunt down the leader of the attack and execute him without missing a single heartbeat, but the blood I would spill would not replace the emptiness in the heart of a child who cannot understand the absence of his or her loved one. My point is much more basic. It is about keeping the spirit of death alive. It is about giving the child a ‘Why” he or she can understand. It also gives us--the adults--a reason for the “victims’” deaths. It helps us see through the child’s eyes that we need to eliminate Terrorism not just through violence. Violence and retribution is only one of the methods. It is the short-term method. When we bring to Justice the responsible, he will have bred others to take his place. Terrorism is like a virulent organism, it will spread and continue to feed on Fear and Complacency as long as we allow it. But if we fight Terrorism with Vigilance, we have employed the long-range strategy to win the battle. And to achieve that, we must place in the minds of Josh Jacob’s daughter, and in the minds of all those who suffered such horrific losses, that the Spartans of Vigilance live. If such seeds grow in the minds of children today, they will be passed on to their children, and their children, and Terrorism will find few places to feed on Fear and Horror and Hate and Revenge as it does today. Stand with your child on the porch, or stoop. Look to the former World Trade Center and tell your child the story of the Spartans of Vigilance. Let your own childish self seep through your callused adult heart, and join the innocent in a world where belief rules and reality cannot be fathomed. See the Spartans standing proud. Let the child describe them. Let the emptiness inside them be shared, and filled with the belief that out of the smoke and rubble of twisted buildings, there stands their mother, father, grandparent, niece, nephew, uncle, aunt, or friend one--watching over the child, protecting him or her, loving them by feeding their imagination, by preserving their innocence as long as possible. Let them see their love one as a Spartan of Vigilance. And, most of all, believe in your heart the cow can jump over the moon, and dish can run away with the spoon. For if you do, you’ll see the Spartans too. Go To: "Above And Beyond The Call Of Duty"